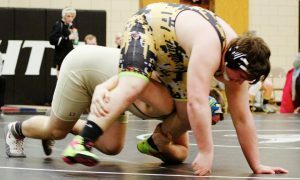 HOUTZDALE – The Curwensville Golden Tide traveled to wrestle Moshannon Valley on Friday, and though they didn’t have the manpower to win the match, giving up six forfeits, they won three of the five actual bouts wrestled. The flu was in full force in Curwensville this week, and several key wrestlers didn’t make the trip. After giving up a forfeit to start the match at 182, Curwensville sophomore Gage Roos (1-20) quickly found himself on his back and was pinned by Mo Valley’s Frank Warholic in just 26 seconds. After another forfeit at 220, Moshannon Valley led the match 18-0. The next match wrestled was at 120 pounds, where Curwensville junior Blake Passarelli (22-4) wrestled a dead even match against Mo Valley’s Joe Ball. While Passarelli had better offense, Ball had outstanding defense, countering multiple takedown attempts. Deep in the third period, the match was tied at 1-1 when Ball and Passarelli got in a tremendous flurry that Passarelli eventually came out on top of. As time expired, there was some pushing and shoving from Ball’s end, and Mo Valley was deducted a team point. Some of the audience was booing, as they were sure Ball had also gotten his own takedown, but the referee asserted his view that Passarelli had maintained a wizzer and had improved his position from nearly being taken down. After that match, the score was 23-6, Moshannon Valley. Following three more forfeits, Curwensville sophomore Adam Straw (11-8) looked savage, smelling blood after getting an early takedown and attacking relentlessly until he got the fall in just 45 seconds over Black Knight Austin Sly. “We need to do more of that!” said an excited Coach Swatsworth. This brought the team score to 23-12, Mo Valley. Overall, Coach Swatsworth was happy. The final score was 47-18, Mo Valley, but some of Curwensville’s best wrestlers didn’t get to wrestle, and some of Moshannon Valley’s wrestlers didn’t get to wrestle. 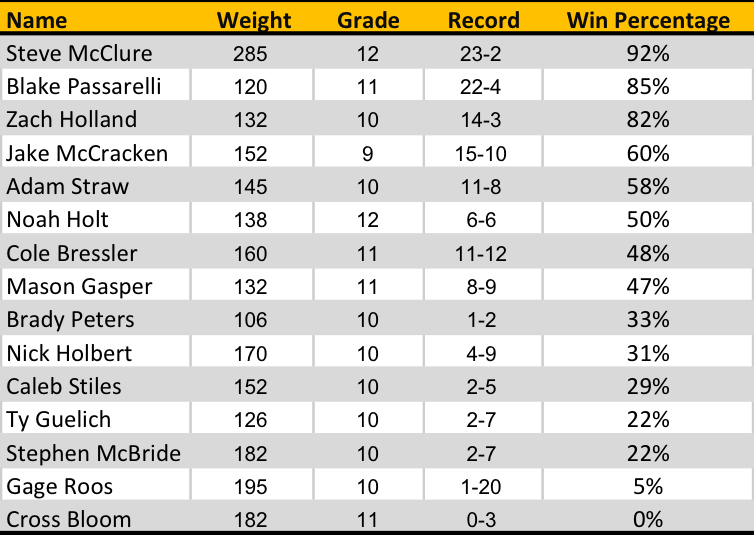 Of the matches that were wrestled, Curwensville won where they should have. Curwensville will return to action Tuesday when they travel to Indiana.